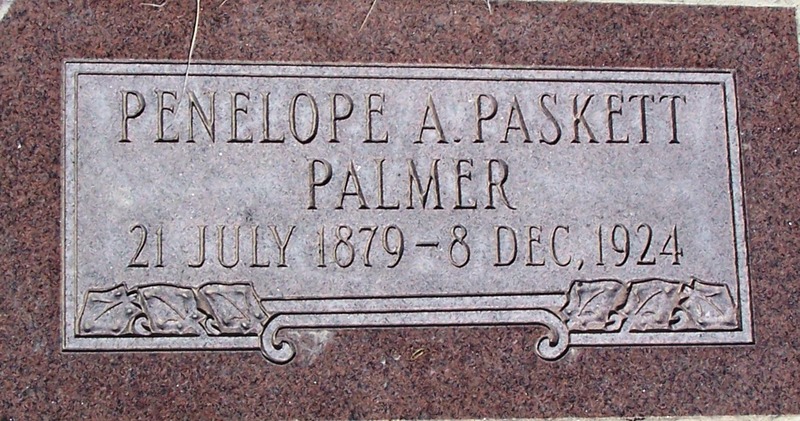 Penelope Ann Paskett Palmer was born July 21, 1879 in Grouse Creek, Box Elder County, Utah a daughter of William Pope and Sarah Ann Henefer. Her brothers and sisters are: Sarah Patience, William James, Louisa Emiline, Cora May and Lillian. Half brothers and sisters Mary Jane, Stephen Henry, Fredrick William, David Mecham, Hattie Lavina, Rhoda Ann, Charlotte, Melvin Oscar, Harold Andrew and John “M”. Her children are: Lyman, Elbert, Arvel, Irene, Varene, Edgar, LeRoy, Willard and William. She died December 8, 1924 in Provo, Utah and is buried in the Grouse Creek Cemetery.